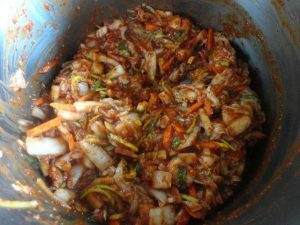 Autumn is the time of making kimchi in Korea. 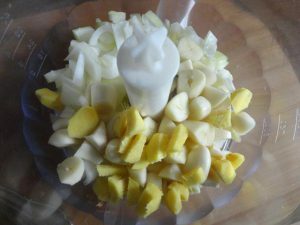 My love for kimchi started after watching the drama “Marriage plot”. 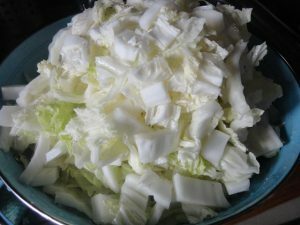 The family of the main character led the company that produced this Korean side dish. 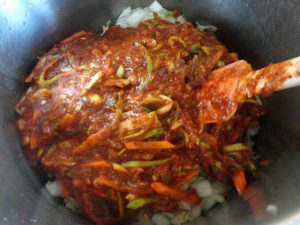 I have never heard of kimchi (as it was possible at all), I did not know what it was and how it tasted, but I could not stop drooling when I saw how it was prepared in front of my eyes. 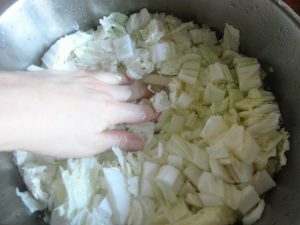 I went to the Internet, read a little, and tried to make kimchi. The first reviewers were my friend and her Korean husband. It tasted as it should, so I was satisfied. 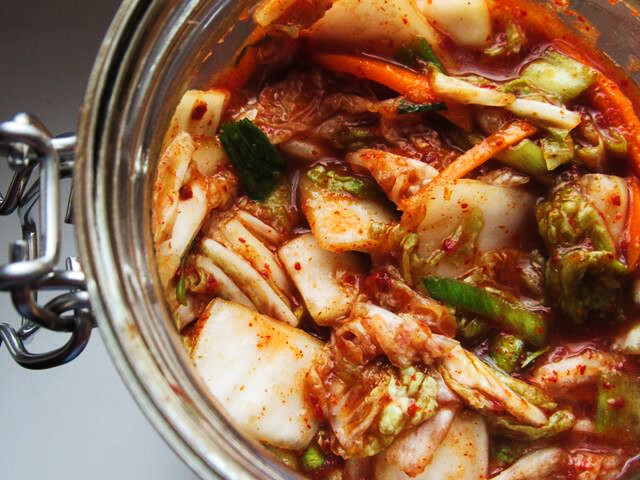 Kimchi is incredibly versatile in use and delicious. 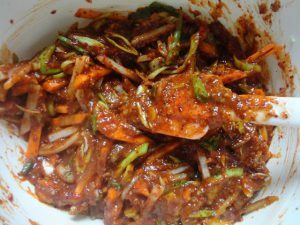 My favorite dishes are kimchi pancake and fried rice with kimchi and egg. 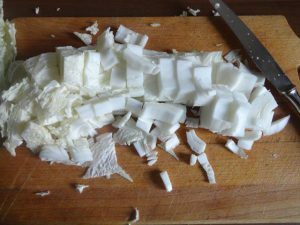 From the beginning I follow the Maanghi’s recipe. She’s the best. But I add a little less of gochugaru, because I do not like when it burns too much while eating. 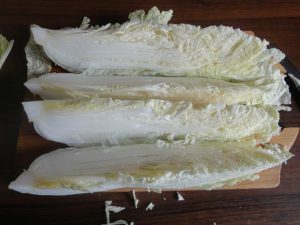 1.Cabbage cut in half, each half into 4 parts and chop into bite size pieces. 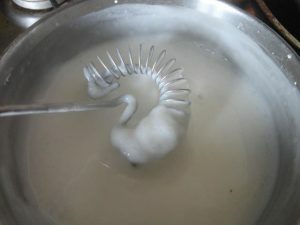 Thoroughly wash in a large bowl (pot) with water and drain on a sieve. 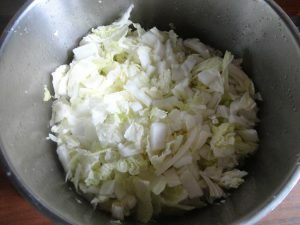 2.Salt the cabbage, mix and set aside for a minimum of 1 h 30 min with stirring every half hour (3 times). 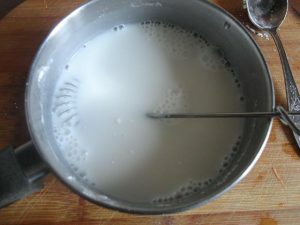 3.Prepare a porridge with rice flour. 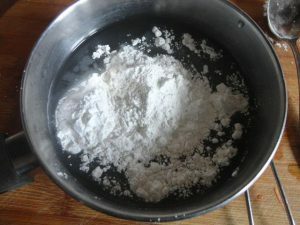 Mix water with flour and sugar. 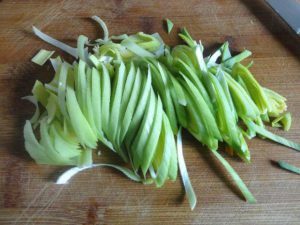 Bring to a boil, mix occasionally until mixture becomes dense and translucent. Leave to cool. 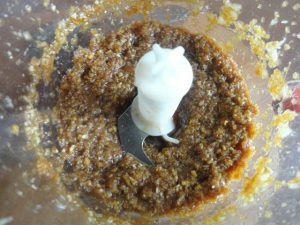 4.Make a paste. 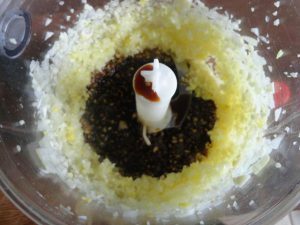 Onion, garlic, ginger and soy sauce blend in the food processor. 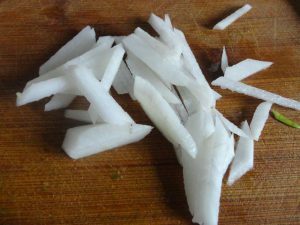 If you don’t have a food processor I recommend to use a fine grater. 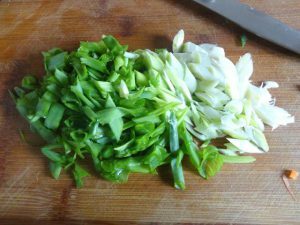 5.Cut all vegetables. 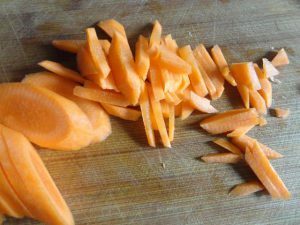 Combine paste, porridge and gochugaru and mix in the ​​vegetables. 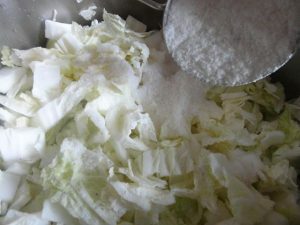 6.After a certain time of salting, cabbage will definitely reduce its volume. 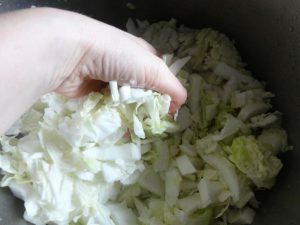 Rinse the cabbage in cold water at least 3 times to clean it thoroughly and drain on the sieve. 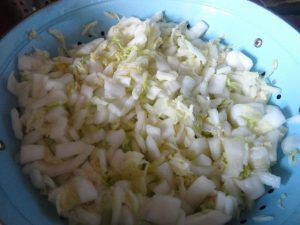 Next mix the cabbage with vegetables. 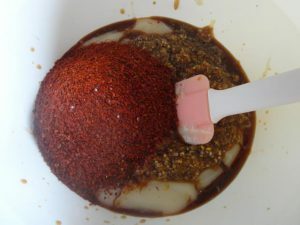 It is best to do it with a rubber glove (you can irritate the skin with paprika). 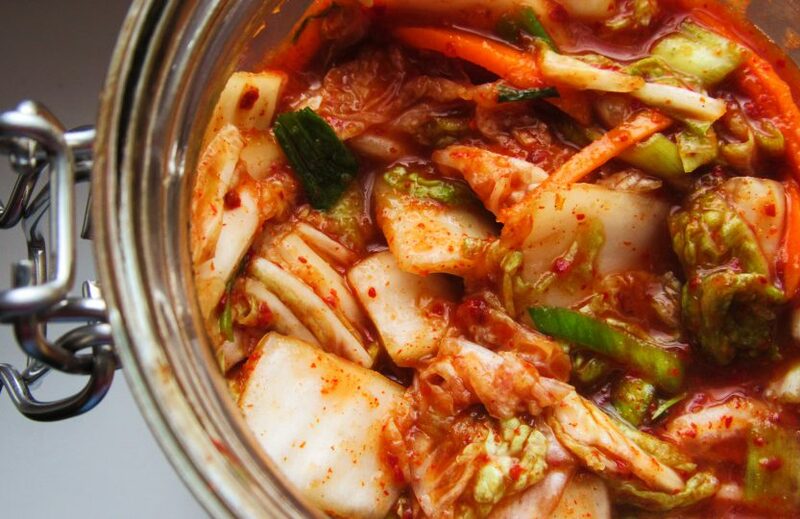 Pack kimchi into jars and store in the refrigerator. 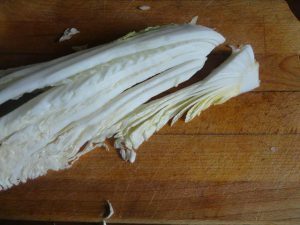 After about 3 weeks kimchi is clearly acidic. 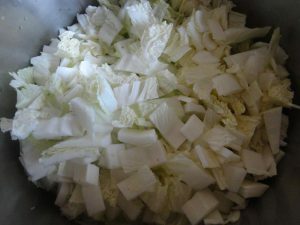 My favorite kimchi is maximum two weeks old. Previous PostIs male fashion boring? With “Goblin”-never!